How many schoolbooks can fit inside a Birkin? I've often had the fantasy of going back in time to junior high or high school, with all the knowledge I have now, and then basically doing everything different. But what I never fantasy about is suddenly being 13 now, and having to traverse the modern world as a middle-aged woman in a teenager's body. That's a scenario likely to land someone in jail, not to mention I wouldn't last a week against today's social media-wielding mean girls. It's that latter scenario which is the premise of Little, a gender and age flipped version of Big, which, yes, means it's a comedy and not the nightmarish horror movie such a set-up brings to my mind. Marsai Martin, who reportedly, at age 10, pitched the movie to her Black-ish boss Kenya Barris, stars as the movie's little heroine, and she also serves as an executive producer on the film (the youngest in Hollywood). Seeing the movie, its origins make perfect sense, as too often Little feels like a clever concept not fully realized. When the film opens, Martin is Jordan Sanders, a smart and eager 13 year old in 1993 junior high. After suffering a humiliation (and frankly, an assault) at the hands of the school's mean girl, she vows to no longer be a victim, and grows up to be the very rich and very mean head of a tech company in Atlanta. Regina King plays the big version of Jordan, and she is so convincing and entertaining as the boss from hell it's hard to believe that just a year ago she was the benevolent and almost angelic boss in the under-appreciated Support the Girls. Jordan's employees scatter and hide when she enters the building and require anti-anxiety meds to get through team meetings. April can't bring herself to share any of her ideas with her as she's seen what disappointing Jordan can get you. (Slapping; shoving; the tossing of your bagels into the trash). Obviously, Jordan is in need of some lesson learning. Enter the magic wand wielding daughter of a local food truck owner, who wishes Jordan were little. And the next morning, she is. Young Marsai Martin is preternaturally gifted, and scarily good on Black-ish, and there's no doubt she's got a movie career ahead of her. She's got the grown woman trapped in girl's body swagger down perfectly, mimicking Regina King's walk and mannerisms so well that it never feels like you're watching a teenager just pretending to be a woman. Which is why it's so disappointing to see three such funny females in a movie that doesn't live up to their performances or talents. Little is afraid to go big, perhaps too beholden to its PG-13 rating and too reliant on its comedic premise to actually flesh out some solid humor. 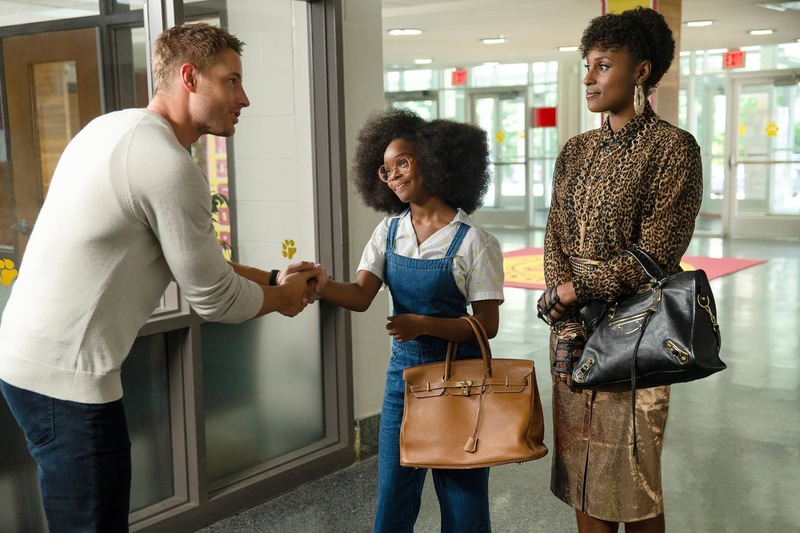 And I'll admit I was a little nervous about how the movie would handle the whole "horny older woman trapped in a kid's body" thing in the scenes with her middle school teacher, played by Justin Hartley. It does manage to skirt the issue before it gets too far into ick territory, but that's also the problem with the movie as a whole; it skirts too much, never really pushing any boundaries, which results in a lot of awkward and flat jokes. For instance, there's a scene where little Jordan and April are having dinner, and what Jordan wants more than anything is a glass of wine. April, obviously fearing both the optics and legal aspects of allowing Jordan a drink, refuses to give it to her...Awkward cut to Jordan singing along to a Mary J. Blige song while laying on top of the bar. Wait a minute. Did she get that wine? Is she drunk? What's happening? The movie kills the joke with confusion by avoiding a shot of Jordan drinking that wine. Issa Rae, so funny on HBO's Insecure, also feels stifled because the movie is torn between two protagonists. Is it April's story? Or Jordan's? But perhaps the film's biggest loss is that, because of its concept, Marsai Martin and Regina King never get to share any screen time together. That is something I know would be worth seeing. Someone get that movie rolling! Marsai, you're a producer now! Do it!